Chair aerobics benefits seniors in a number of ways, including the preservation of muscle mass and bone density, promotion of heart health, and reduction of age-related aches and pains. So grab a chair and tackle these chair exercises for seniors! 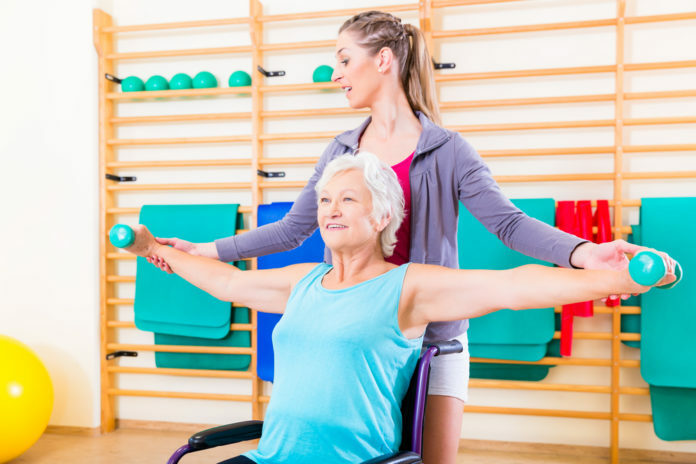 With limited mobility, you may be concerned you or your loved one will not be able to exercise as frequently, along with worry of falling and injury if you so wish to try. And while agility may not be as prominent as the younger years, there are chair exercises for seniors to keep active, all while feeling as safe as possible. While sitting sturdily in a chair, mimic the motions of a march by lifting the feet off the floor. Seniors can raise heart rate greater by swinging their arms, along with exaggerating and heightening the momentum with each march and swing. Continue this motion for one minute, or work up to the duration as you start to become more comfortable and advanced with the movement. Arm punches are a valuable aerobic exercise, all while strengthening the arm muscles. Start by clenching each first and lift the arms as if you are protecting yourself from an oncoming punch. Alternate and punch the fists out straight ahead as if hitting an object in front of you. You can involve the abdominal muscles by punching out to the sides and rotating the torso. Pump and alternate between each arm for one to two minutes, or longer as tolerated. Strong arms help keep you independent enough to carry bags from the store, fold laundry, and many other day-to-day tasks. While sitting down, strengthen the biceps by using a light weight or soup cans in each in each hand, turning the palms forward, lifting the weight toward the shoulders. Complete 8 to 12 repetitions for two to three sets, or stopping when arms feel fatigued. While seated, alternately kick your legs straight out in front of you and pump the arms for greater cardiovascular benefit. For added support, do not pump the arms and hold onto armrests. Kick for one to two minutes. In the seated position, simply lift one foot about six inches off the ground and motion in a clockwise circle. Complete five to 10 circles then repeat with the other foot for two to three sets. Add ankle weights for added resistance as desired. Sit on a sturdy chair, place feet firmly on the ground in front of you, place your arms across your chest, and lean back as far as you comfortably can. While engaging your core muscles, twist your torso to the left, return to the starting position, and twist to the right. Complete three sets of 15 repetitions each, or work to that number, to activate muscles in the core. Find more core exercises for seniors here. Work the chest and upper back muscles by holding arms out in front of the body, placing the thumbs toward the ceiling and bending at the elbows. Pull both elbows back as far as possible while squeezing the shoulder blades together, then extend and press forward. Similar to the bicep curls, hold onto light weights or soup cans for added resistance. Complete at least 15 to 20 rows, working up to a greater number as tolerated. But before starting any sort of exercise regimen, it is always important to consult with your primary care provider, as they can direct you to and ensure safe exercises to lower the risk of injury!